About two weeks ago me and my husband took the train to Hoboken after work and hung out by the pier that over looks New York city's beautiful buildings. The weather was beautiful and we grabbed some grub and a few drinks. Don't you just love summer! I couldn't pass up on taking a few pictures with this beautiful view. There's something about staring at the water that makes me feel clam and I just get lost in my thoughts. When I use to live in NYC when I was younger, I use to go by South Street Seaport and just sit and look at the water. It's a very therapeutic thing for me. 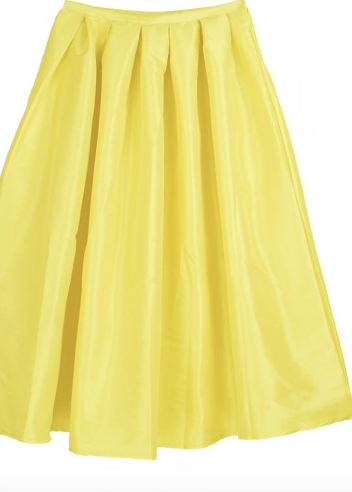 On to the outfit, I wore a yellow midi length skirt with a blank tank. I love the bold color of this skirt and I love that it's flowy. I kept the whole black and yellow color combo going with these black ankle strap sandals which are very comfortable to walk in. I did however added a little color mix with this statement necklace from Premier Designs. The light gray and teal colors blended well with the bold yellow for a nice summery mix. I can't get enough of this necklaces, I just love a bold statement on my neck. Beautiful outfit and Beautiful view. I love NY btw! Love your hair cut! You take lovely photos! !